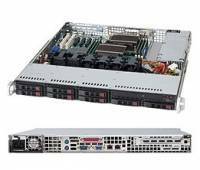 1U SuperChassis 113 Supermicro's SC113 1U chassis is optimized for high-end, high performance applications. It is an efficient 1U rackmount design optimized for best performance. It includes 8 hot-swap 2.5" SAS/SATA hard drive bays protected with the SES-II management features, and redundant 650W or single 560W/700W high-efficiency power supply with optimized cooling for all configurations.